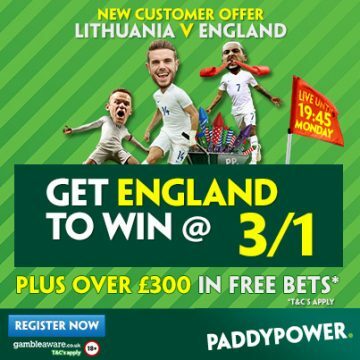 Read our analysis of the last game in Euro 2016 qualifying action and get our best betting tips as Lithuania hosts England in Group E.
England to win 3/1 + £300 FREE! Click to claim! England look to complete a perfect qualification campaign when they travel to face Lithuania on Monday night. They took care of business against a potentially tricky opponent in Estonia on Friday, winning that game comfortably 2-0 and demonstrating that manager Roy Hodgson does have depth, at least in terms of his options against that level of opposition. It’ll be interesting to see what sort of line-up England put out on Monday, but they’ve proven to be completely dominant in this group scoring 28 times, conceding just three and winning nine out of nine. The possibility of finishing with a perfect record should be motivation enough for England in this game. Lithuania’s qualifying campaign has generally been disappointing, but a 1-1 draw away at Slovenia in their previous game probably represents their best result. They did a good job of getting men behind the ball and controlling the rhythm of that game. Slovenia had some good chances, but Lithuania made life difficult in terms of pace and easier on their goalkeeper. They played much better against Slovenia, but we still suspect that Lithuania’s defence is a little susceptible and it will get exposed by England. England’s motivation will be to complete a perfect campaign and during a difficult period for the national side, we think they’ll be keen to make a statement and make it 10 out of 10. They’ve score 28 and conceded 3 in nine games, we like the fact that we’re getting an Asian Handicap win at what is effectively two goals. England should cover it, even away from home.